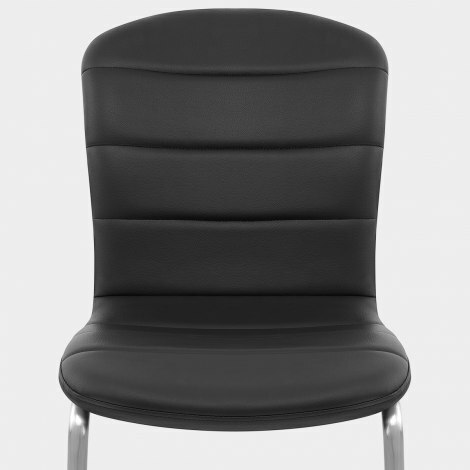 The elegant Mica Brushed Dining Chair Black exudes class, with its flowing design and smart style. A practical piece for a variety of locations, the Mica offers modern grace and will become the best seat in the house if you choose it for your home. 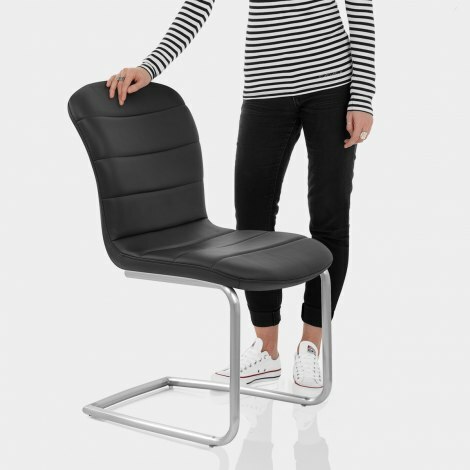 Comfort is helped by the padded seat that is upholstered in black faux leather. This soft and tactile surface is segmented into horizontal sections, which accentuates the dense foam beneath and alludes to traditional design, whilst the tall backrest has added ergonomic support. The accommodating seat is held at the perfect height for any dining table and is kept rigid by the substantial steel framework, fashioned from a single tubular pipe and hand worked into a contemporary brushed steel finish. The cantilever style adds even more comfort and has a wide, stable stance, whilst below can be found protective floor guards, helping to keep scratches at bay. "Lovely shape of chairs and comfortable to sit on"
Speedy delivery and good product at attractive price. Good value for money. Great chair for our computer table in our kitchen. Easy to assemble, good quality, comfy and looks great!